When did you first become interested in Architect-Led Design-Build? I knew I wanted to be an architect from a very young age. Growing up around construction, I was so intrigued by the entire process. I loved being on the job site watching the architectural plans unfold into a beautiful home or building. I always thought I had to decide on which path to pursue: architecture vs. construction/office vs. jobsite. I had been exploring the idea of both disciplines from a very young age, and it grew into a focused research project for me by the time I reached high school. I don’t think there was ever this “ah ha” moment. It was a passion that I had from the start. Can you describe the process of ALDB? As the Architect, we contract with the owner both to design and to construct a building, and we procure the construction services by contracting directly with the various construction trades. Can you walk us through a typical project? In ALDB, we start our projects very similarly to a traditional method. We start with a budget and scope. If the budget and scope are approved, we start to design. Once we complete our schematic design, we provide an updated preliminary estimate. Once we confirm we are within budget, we continue to refine the design and the cost estimates. We want our clients to be informed and included throughout the entire process. This factor creates a trusting relationship between our firm and our clients. With our method, the clients only need to communicate with us. There are less parties involved making communication much more efficient. Depends on the complexity and size of the project; some are hourly design fees with the Construction documents set at a fixed fee which is determined after Schematic Design. Most of our projects are defined well enough that we can provide a professional fee plus reimbursable expenses. Our Construction Management fee is a fixed fee which also includes a pre-construction management fee. Occasionally we will perform Construction as a fixed price. What are some of the risks and rewards of ALDB? If a problem arises, there is only one place to point the finger. In the traditional design-bid-build method, miscommunication between Architect and Contractor can cause unnecessary tension. With ALDB, the entire process is much more cohesive creating a team-like environment. The clients also feel a sense of comfort when only having to communicate with one entity. What are the three greatest challenges with ALDB process? Higher Insurance premiums – This is one of the main reasons why we separate our business entities, having separate insurance for both entities and separate contracts for the client. Most Architecture firms can take on smaller projects if the work load is slowing down, and most builders have very small overhead to compensate for the slower times. With ALDB, you need to have separate staff for both Architecture and Construction; it’s a bigger machine to feed. Training new staff is much more of an investment because overall, they are becoming much more knowledgeable about our whole profession. There is even more training involved because new staff must learn both Architecture and Construction. It is extremely gratifying to educate Architects to think in a different way. What are the three greatest advantages of ALDB? One of the best advantages of being an ALDB firm is that we get to work directly with the craftsmen themselves to discuss how we can make improvements to the project; it is a learning experience for both of us. We appreciate this close relationship, and I am certain our craftsmen enjoy working in close contact with the designer. The designer and the craftsman work directly together. As the Architect, we take on a role that allows better control of project budgets, schedules, and overall project quality, including the quality of design. It’s so much fun. I think it’s so much fun because we are truly going back to being Master builders. As Architects we love to problem solve; that’s what we do all day long, but now it’s even more in depth and more dynamic. Do you see ALDB as a way for Architects to take back “control” of the design and construction process? For certain markets, yes. I have had the pleasure of working on projects with unlimited design budgets, having total control of the project as the Architecture firm. In reality, not every client is going to have an unlimited budget. The client relationship in ALDB is far greater than in a traditional design-bid-build method. We have found our clients to be so much more appreciate of our talents on our design-build projects vs. our design only jobs. Some of our design jobs have a 2-3 month duration, followed by phone calls and quick site meetings. In design-build, we have a much closer relationship with our clients; most of them feel like family before the project is over! Why do you think that most Architects, Clients and Contractors shy away from ALDB? For Architects, it is not necessarily something they ever thought about because they weren’t introduced to it. We are trained in (most) schools to be Starchitects with grand budgets. After school and our internship is completed, most architects find the niche they are most comfortable in. I cannot say that ALDB is easy nor is it for everyone to pursue. There is a more executive and dynamic role; there is a much more entrepreneurial mode to ALDB as opposed to running a boutique design firm. You can be a one-person design firm, but to do design-build you need to build a solid team. The daily tasks of designing, managing the office, managing the sites, and keeping finances in order is not for everyone, nor can one person do it all. It requires a great team, and we are fortunate to have that. I have not yet met a client who shied away from ALDB. However, we do work on design only jobs. This usually happens when the client already has a relationship with a contractor. We are agreeable to this because we can only build so much, and we want our clients to be comfortable with who they are working with. For contractors, there is a sense of losing the market. Good builders and contractors should not be concerned. They may choose to adapt, but to be honest I do not think this will be some sweeping trend in the AEC industry. What are some of the tools you use (from AIA, NCARB, Insurance Company, Other Professional Organizations) to help you manage your firm’s performance and reduce risk? I have read a lot of literature on ALDB; the AIA has a few great articles as well as a book on ALDB. There is an organization specifically for design-build called Design Build Institute of America (DBIA). This organization is geared more toward government and large-scale projects. There are also a few attorneys who have published articles on ALDB that have been very helpful. My research has lead me to separate my design and construction contracts, but each project is unique. I treat each project differently. I cannot really say I have a set method because our scale of work differs so greatly, spanning a large spectrum. On one end, we have worked on small kitchen renovations, and on the other end we have done new construction on vacant lots. 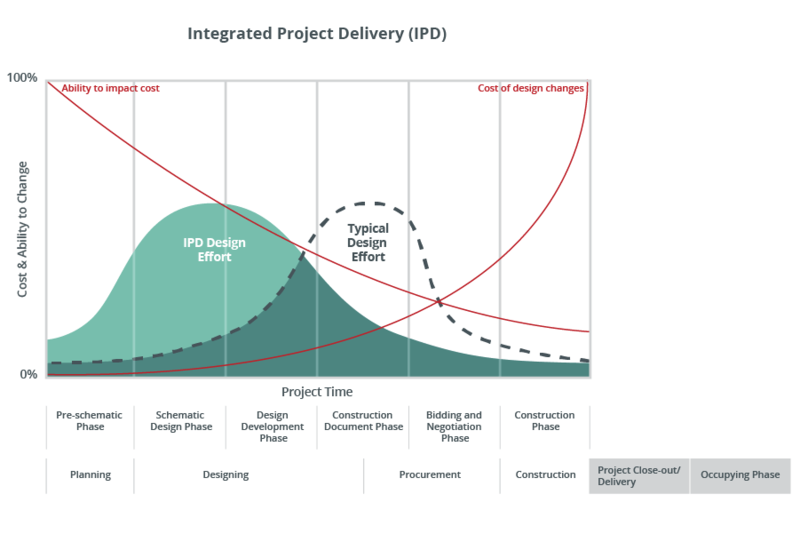 What is the percentage of ALDB your firm is currently working on – what are the major differences between traditional project delivery vs ALDB projects? Being recently engaged in a few large multi-family developments, we’ve found that we are providing more than the basic services on those scale projects. This is due to our experience. Developers are taking advantage of our management and construction background. Our role is much more than just producing design documents. I would say we are about 60% design only and 40% ALDB projects. Is there anything you would like to see to make the ALDB even better for future projects? I hope to see more architecture schools incorporating some type of design-build programs. If Architects played a larger role, communities would greatly benefit. It would be nice if ALDB gained more popularity so that clients can learn to appreciate Architects playing a larger role.